Half helmet ear pad for SPH10H-FM / SMH5 / SMH5-FM. Includes replacement speakers and boom mic. Can’t get it to stay tucked in the helmet. Overall good sound quality, but can’t get the ear flaps to stay in the helmet. The other person can hear wind BAD when I’m talking due to it being a half helmet. Sena was supposed to have the wind sound thing whipped, but I reckon not. Not impressed. Not difficult to install and works great. I bought this product so that I could switch back and forth between a 3/4 helmet and a half helmet. I also purchased a wired mic so that I could also use in a full face helmet. Great product, wish I hadn't waited so long to purchase one. Does not work as well as my full face Sena, but, I did not expect the half face to. I can still hear at highway speeds. Excellent solution for half helmets, now i can move my SENA device between helmets. Already bought the SMH5 dual set, and sometimes (in good weather) like to use my half helmet. To use with other helmets. Necessary on the SMH5 due to no Headset plug for ear buds. Besides that I'm happy with all Sena's product line. I really like to wear a half helmet so I bought this so I could switch back and forth from 3/4 helmet to half helmet. I have two helmets. I now can switch between using the full face to the half helmet . If I bought a SMH10, could I attach my SMH 10 to the pads listed here? are the earpads sold by themselves without the electronics? 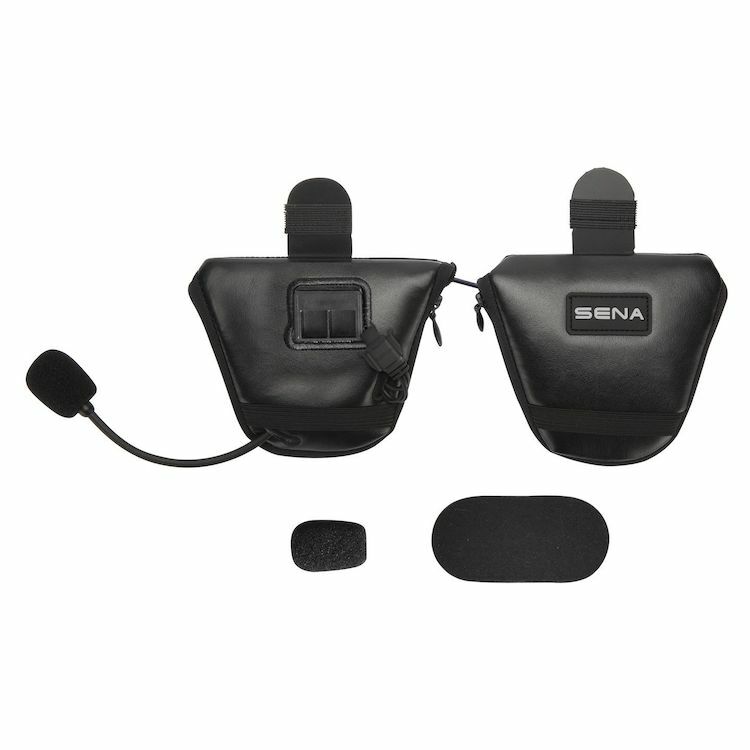 I have a half helmet and would like to hook up my sena 10r gear to it, would the sena speaker pads accomodate my speakers? Dos this include the electronics? So I can simply transfer my unit from one helmet to this ? BEST ANSWER: This includes a set of speakers and a boom mic. If you already have a SMH5 or 5FM, on another helmet you can just slap in on and go. Is this Bluetooth or do I need an audio system to hook this up to? what do i need to get to talk with my rider? will i require 2 of them? How many riders can I connect to ? BEST ANSWER: Many, but only one at a time. I have the SMH-5 and with this you can cycle between the other riders. Will this work with the 20S Sena?